Drinking beer in Myanmar usually happens at a beer garden. 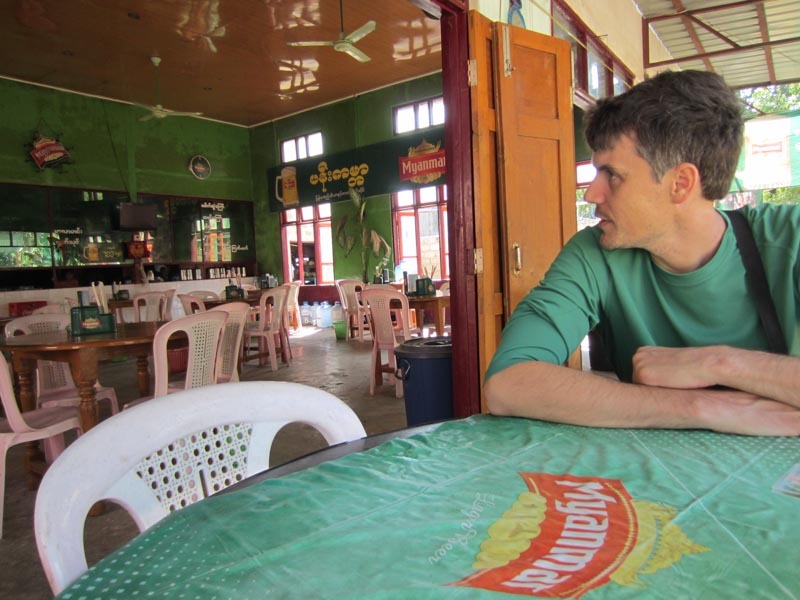 The Burmese head there when the sun goes down, ordering draft beers and BBQ or fried foods. The atmosphere is exciting. People are happy and sociable. Cigarette girls come around trying to sell packs of smokes. Kissing noises are heard, but only to attract the waiters. Premier League football is often playing on the TV, with the Burmese locals cheering on their favorite English team. An empty beer garden midday. If you’re in Saigon and you need a break from the ‘beep’ or the ‘beeep beeeep!’, then a trip to Mui Ne is my suggestion to you. It’s a cheap bus ride from the backpacker district and there are plenty of hotels and resort where you can sit by the pool or the ocean and just relax. There’s also a few sights to see around the area. We rented a scooter and cruised around, stopping to see the amazing Fairy Stream. The seafood in Mui Ne is great. We spent far too much time throwing entire once-living creatures down our gullets. For lots more information about traveling to Mui Ne on the cheap, check out my guide to Mui Ne, Vietnam. In this episode of Exploring Vietnam, I investigate the Mekong Delta and its oh-so-fertile lands. The Delta is responsible for 40% of Vietnam’s food. It’s a very important place that is often over-looked by tourists. 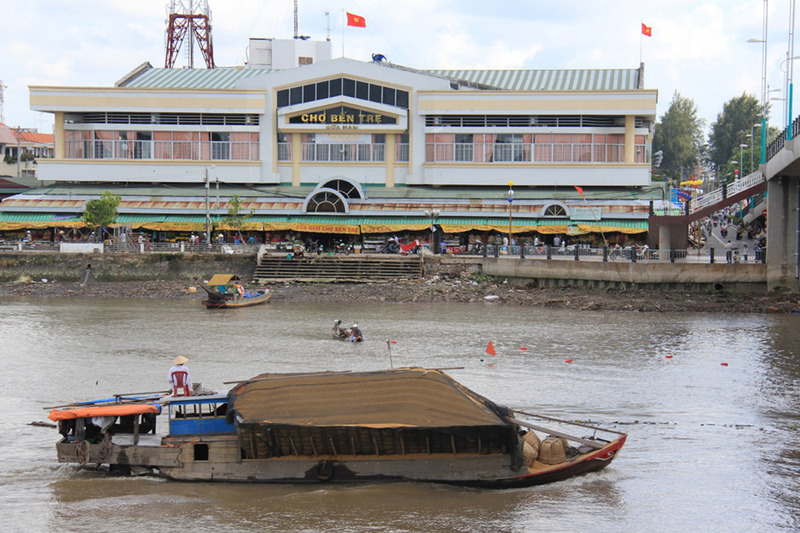 From Can Tho, I visit the local market, take a bicycle ride around farm land, and tour the floating market of Cai Rang. Learn about the popular fish of the area, see the area’s fruit growing in orchards, rice paddy fields, and of course the craziness of the floating market. The Mekong Delta is my favorite place in Vietnam. If you make it to the country, don’t skip this miraculous area. The Cham Islands, Vietnam: Read this before you go. The 21 km mountain pass that cuts through the Annamite Mountain range, is widely considered the best road in Vietnam. Whether you are in a car or on a motorbike, you’ll experience curves that make your heart beat faster as you drive past beautiful scenes, including the South China Sea from 1500 feet up. Pangkor Island, Malaysia: AWESOME! — and then some! Pangkor Island can easily be reached from Puduraya bus station in Kuala Lumpur. You can catch one of the many buses (20-28 ringgit, 3.5-4 hrs) that leave in the morning (from about 7AM-2PM) to Lumut. At the Lumut bus station, it’s a short walk to the ferry terminal where you can grab one of the frequently running boats to Pulau Pangkor, or Pangkor Island. Pulau Pangkor to Penang, Malaysia: Taxis, boats, and buses. When we were planning our trip to Malaysia we originally had planned a stop or two between the island of Pangkor and the state of Penang. Knowing that we’d have to take 2 boat trips and a bus, we thought it would be too much in one day. Of course, plans change when you’re traveling, and we ended up having to go all the way to Penang in one, fairly easy, fairly short day. Here’s the best way to get from Pulau Pangkor to Penang (and also the cheapest). The best advice I have about getting your Vietnam visa in Kuala Lumpur is: don’t do it if you don’t have to. Vietnam now permits visas on arrival if you are flying into Ho Chi Minh City, Hanoi, or Danang via an international flight. You simply find an agent to get you a letter of approval (Google ‘Vietnam visa on arrival’ and you’ll find a bunch of companies to choose from), print out the letter, and bring it (along with the visa fee in USD cash, your passport, a completed copy of the Entry and Exit form, and one passport size photo) to the “Landing Visa” counter when you arrive in Vietnam. Vung Tau, Vietnam: Jesus Hates Me. This I Know. 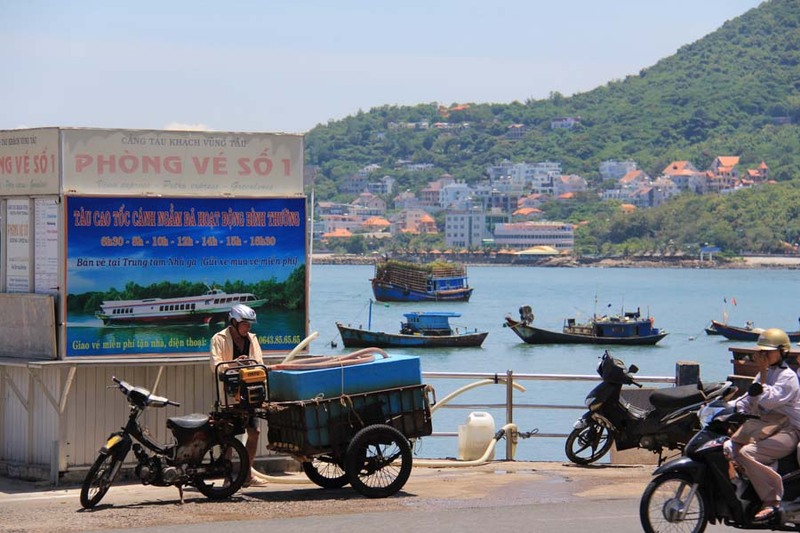 By the ferry terminal in Vung Tau, Vietnam. If you’re looking for a short vacation while in Ho Chi Minh City, Vung Tau will hook you up with that sweet sweet ocean noise. It’s the closest beach town to Saigon, so it’s popular but certainly wasn’t busy when we went on a Monday/Tuesday. The city is on a peninsula and it feels very Miami Vice. Ben Tre, Vietnam: Tour-less in the Mekong Delta. The highlight of Ben Tre, the Ben Tre Market. We almost decided not to go to the Mekong Delta. It’s one of the places we found the most difficult to research transportation for. Even Lonely Planet’s Southeast Asia on a Shoestring suggests that the easiest (and cheapest) way to do it is to buy a tour from a travel agent in Ho Chi Minh City. This may be an easier option but the idea of spending three days on a tour bus, cramming in as many towns as possible, and eating in the prescribed restaurants is not really our scene. We decided to go at it alone. 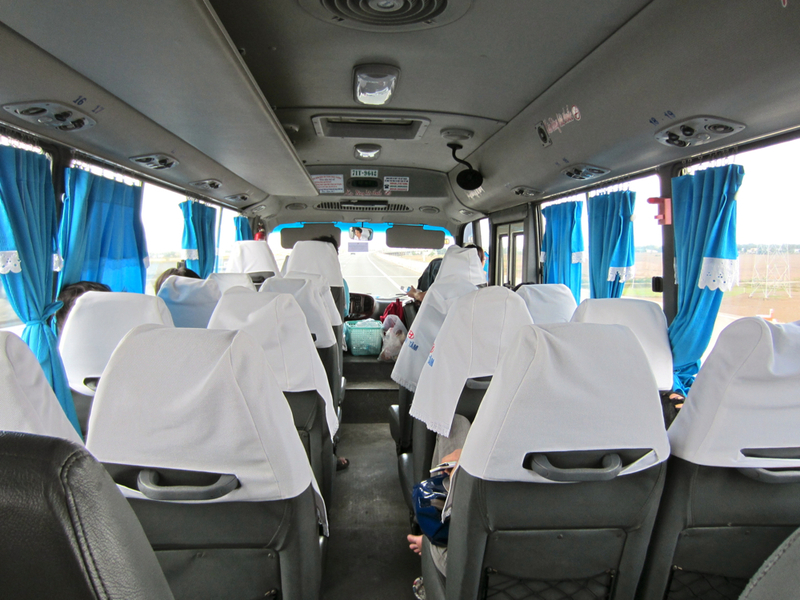 The minibus from Ho Chi Minh City to Ben Tre. Our first stop in the Mekong Delta was Ben Tre.